The Life Extension Blog: Is Blue Corn Healthy? Anthocyanins are a type of plant-based antioxidant found in abundance but not exclusively in berries. Take, for instance, blue corn, which is regular yellow corn that has a high level of anthocyanins. The anthocyanins are actually what give it a bluish hue. So this is why we’re interested in both blue corn and anthocyanins. See where we're headed now? 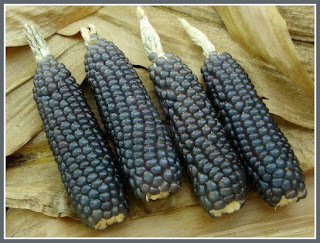 Blue corn is open-pollinated, so its growth is not as easily regulated as that of commercial hybrid yellow or white corn. It is a floury corn, and it has about 30 percent more protein than the average hybrid corn. It is still widely used in the Southwest and Mexico where it is a staple food. Most of the corn available today is genetically modified and we know this is a serious concern for many of our customers. However, it is easier to find non-GMO blue corn than a non-GMO yellow or white variety. But because the United States Department of Agriculture (and other agencies) doesn't require GMO labeling, it is impossible to be 100% certain that you’re eating non-GMO blue corn. Trusting the source of the corn is very important. Blue corn supplements, standardized to anthocyanins, are probably a better way to go if GMO is a concern for you. Ask the manufacturer for a certificate of analysis (COA) proving a non-GMO source for their product. Is this foolproof? No. But a COA documenting the raw materials is reliable coming from most reputable companies. Lastly, eating too much corn can result in post-meal sugar spikes and insulin dysfunction down the line. So it’s probably best to limit corn in your diet (some respected health advocates believe in eliminating corn completely) and, in that case, consider a blue corn supplement. One of my favorite recipes is for tortilla soup but made with non-GMO (if you can find it) blue tortilla chips. Before you judge me for enjoying tortilla soup, take a look at the ingredients. This is a healthy soup that I enjoy on occasion — mainly because I am not the best cook. Heat butter or butter spread in large saucepan over medium-high heat; add onions and garlic; cook 4 minutes or until crisp-tender. Add broth, undrained tomatoes and chilies, chili and cilantro. Bring to a boil. Break 4 chips into the bottom of each serving bowl. Ladle soup over chips. Squeeze lime over soup. Divide and arrange remaining tortilla chips equally around rim of each soup bowl to create a sundial effect; serve. Calories: 353 per serving (1-1/2 cups each). Yes, I know what you're probably thinking - the amount of anthocyanins in blue tortilla chips is minimal, at best. You're 100% correct. So if you really want to benefit from blue corn, then supplements are probably your best bet. That being said, this really is a delicious soup. Try it anyway - enjoy! Int J Oncol. 2009 Dec;35(6):1499-504. Ann N Y Acad Sci. 2009 Aug;1171:137-48. J Agric Food Chem. 2009 Feb 11;57(3):826-31. J Agric Food Chem. 2008;56(3):630-5. J Agric Food Chem. 2003 May 21;51(11):3313-9. J Agric Food Chem. 2006 Jun 28;54(13):4557-67. J Agric Food Chem. 2008 Sep;99(9):1841-6. Cancer Lett. 2001 Sep 28;171(1):17-25. Are the anthocyandins still active after cooking the corn? Anonymous - Cooking can degrade some of the anthocyanins found in blue corn. The Garden of Eat has Blue corn toritilla chips made with organic blue corn. It also has no gmo's, it's gluten free, kosher-certified and delicious with mango salsa. Anna Wright - We appreciate your continued support! Yes..i've tried this in regular..really good..